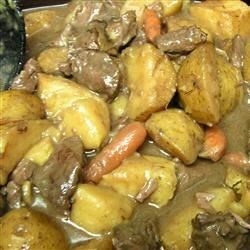 "An awesome beef stew that will warm up those cold winter days." Cook the beef on the stove over medium heat in a large, ovenproof pot or roaster until brown. Remove from heat and stir in flour until cubes are coated. Stir in carrots, celery and onions. Season with salt, thyme, mustard, pepper and bouillon. Finally, pour in water and wine. Cover. Bake in preheated oven 4 hours. Serve hot. This is very easy and good. I also added a couple of potatoes. I added extra water so it wouldn't dry out and would provide extra gravy. Husband rated a 4, but I'd only give it a 1, so it got a 3. Will not make again. I prefer "traditional" stew better. Left an unpleasant taste in the mouth. Very tasty. Different than your average beef stew.